As I climbed into the Sky Condo to start the 2017 hunting season, the top step broke off from the tree sending a chuck of wood to the ground and leaving the bulk of the rung hanging down to the next step. I lifted my gun off my shoulder and slid it onto the floor of the Sky Condo and them threw my backpack up. I got myself into the stand and looked down at the damage. We were going to have to replace a few rungs before the following week. And my silent entry into the woods was anything but. 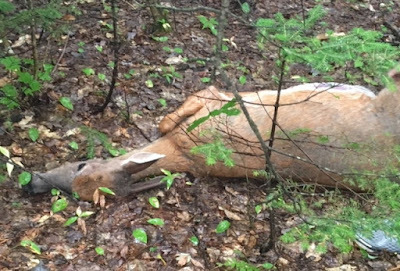 I sat there for a couple of hours and then headed for my stand in the woods to see if anything was walking through. I was cautious walking in and looked for any sign of brown. I made it around the corner when I heard that tell-tale sound of a deer blowing. I watched as two flags ran from under my stand, away from me and into the ticker woods. My cover was blown but I had hoped that the deer would head towards the stand that Hubs was in since he had a doe permit. No such luck. I sat in my stand for a few hours and then Hubs and Dad showed up to get me and head out of the woods for lunch (this was two days before this happened) We didn't stay out long and made a plan for the rest of the night. I was heading back to the Sky Condo to sit and asked Hubs to walk me back in to make sure that I was all set getting back up, given the broken rung. I made it three or four rungs up when another one broke beneath me. 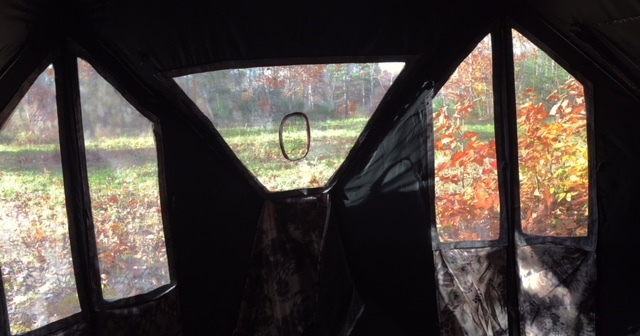 I lowered myself back to the ground and headed over to Hub's ground blind to wait out the rest of the night. Nothing was moving and I was out of my comfort zone being on the ground. I walked out at the end of legal hours and closed out the first day of the rifle season with seeing two deer butts running away from me...but at least I saw deer! We decided that night that this is the last season of the Sky Condo as we know it. There will be a bigger and better Sky Condo for the 2018 season. Stay tuned for that!